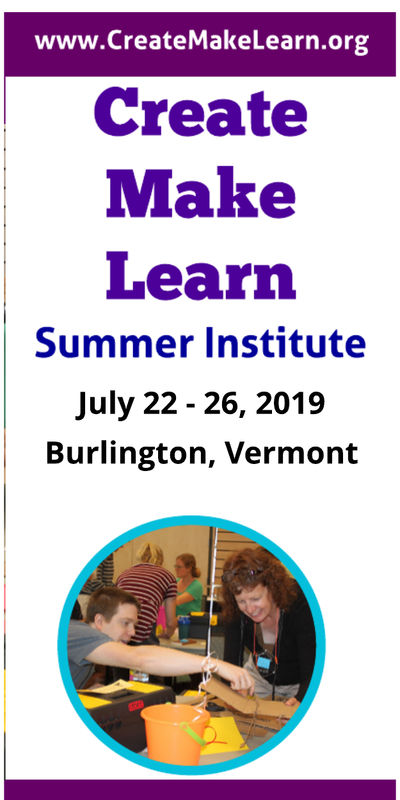 This summer at Create Make Learn Summer Institute I had the privilege to watch an serendipitous story of professional learning take place that inspired me so much, I just had to share it with you. It was the story of two teachers growth as makers inspiring each other as they reached for the stars. Both of them have agreed to share their part of the story as a guest author. I’ve decided to release both posts today since you really need to read both post to appreciate the whole story. It is unlikely that Joanna Elliott (elementary arts educators) and Dan Tolle (high school design technology teacher) would have crossed paths in traditional professional development events. They teach in different towns; they teacher different age groups; they teacher different content areas; and they came into Create Make Learn with very different levels of experience with maker-ed. Joanna claimed to be a newbie to maker-ed. Dan was a seasoned instructor of design and technology and experienced maker. Somehow they ended up sitting back to back pushing their own limits as they planned their individual projects to complete as part of the 2016 summer institute. After noticing Joanna’s painting a large piece of cardboard black as she designed a prototype for a constellation project she plans to do with her elementary students, Dan got a new idea for his own project-- one that just might work with his high school astronomy students. One of the greatest things about a makerspace is the community and how you inspire each other and learn together. 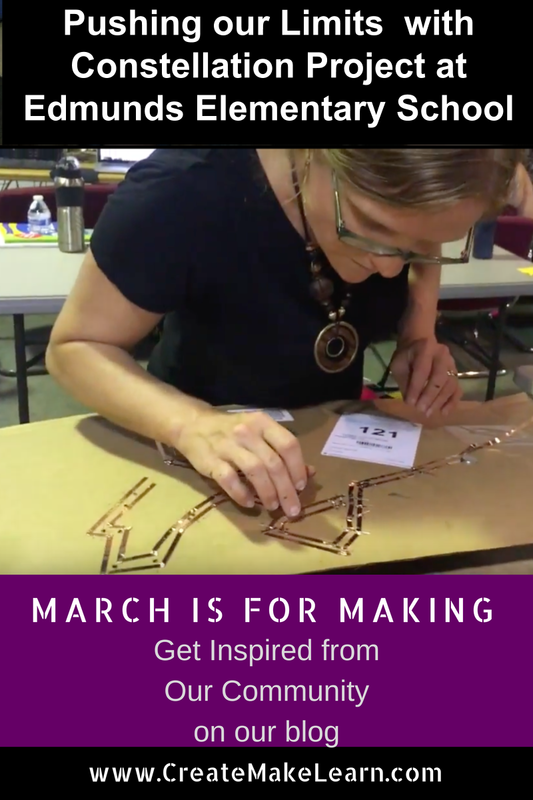 Thank you, Joanna and Dan, for sharing your story as guest bloggers for March is for Making #15 and #16. I hope that reading about two very different and personalized maker projects of two connected educators pushing the limit inspires you to push your own limits and reach for the stars. A lesson and prototype for GR 4-5 to explore mythology, constellations, and circuitry. Students will design original constellations and tales and create a physical representation using paper circuits. 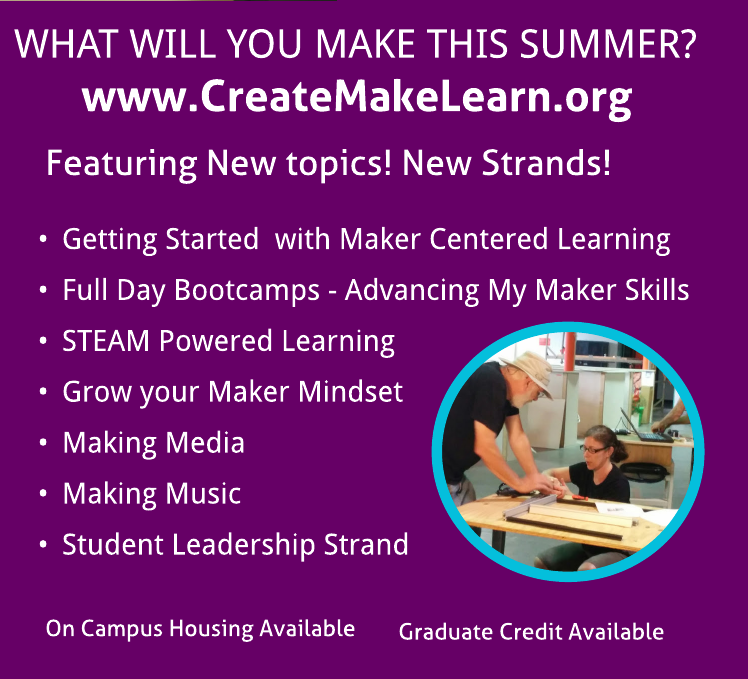 Coming to Create Make Learn Summer Institute was exciting, with folks everywhere bubbling over with ideas, and it was a little overwhelming. As a first-time participant, there were people light-years ahead of me in their content knowledge on Making, and it was slightly intimidating. The thing that helped me was to not get too lost yet in the upper tiers of possibility, but to focus on a skill I know a little bit about and make it stronger. 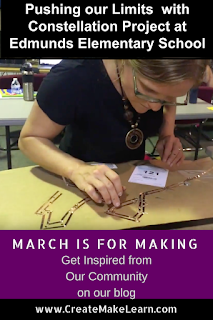 As an elementary art teacher at a school with no Maker Space, I realized that while there was genuine appeal for me in taking a week of laser cutting or RETN movie-making, it would be in the best interest of my students to improve my own learning in an area which they would access. One thing that I have taught before is simple paper circuits, but really with no more than one battery and two LEDs at most, and always in a series circuit. After taking the paper circuit class, I tore apart the little template on parallel circuits and realized that they are no more complex than setting up a little train track (I have kids, and do that with them often). The question in my mind was to wonder where the upper limit might be on how many LEDs could be powered by a single button cell. See? Just like a train track. The reason that I wondered this was that I felt my single- and double-LED circuits were feeling a little stale. And if I wanted the students to have more choices, I needed more as well. My classroom is a place which integrates heavily with other subject areas, so my fifth-graders’ unit on space is a natural alignment with paper circuits, and could allow them to draw with light points, if enough LEDs could really work. As I was working on my project, I asked around and folks told me that I probably could not power more than six or eight LEDs on the same circuit. But like students in my class are expected to experiment, and yes, fail, I thought I should do the same. Bucking advice, I tried for Taurus, and soldered on eleven LEDs to my copper track, and it worked! That was pretty thrilling, so next I tried Orion, and that same little button cell lit up twenty LEDs! My goal is for students to work in teams on the project, to draw on the strengths of the individuals to design, paint, and wire the constellations they choose. We are going to use low-tech approaches to altering the amount of light each LED puts out to mimic the real stars, by doing things like covering them with blobs of hot glue, sanding the LED, or covering them with translucent tissue paper. The neat thing about this experience is how transferable this new knowledge is as an art skill. In addition to being able to add a nearly limitless number of LEDs to paper circuits, I understand soft circuits now too, and could wire up my Halloween costume with tons of LEDs and become a truly Starry Night!